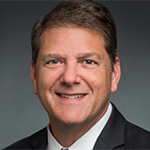 General Motors has named Everett Eissenstat, who has more than 20 years of international government affairs experience, senior VP-global public policy. Most recently, he worked in the White House as deputy assistant to the president for international economic affairs responsible for development and coordination of policies regarding trade, energy and financial institutions. Eissenstat served as lead US negotiator for the G-20, APEC and G-7 economic summits. Prior to the White House, he worked in the office of the US Trade Representative and was international trade counsel for the Senate Finance Committee, where he handled issues impacting the automotive business in the areas of trade, regulation, energy and sustainable development. At GM, Eissenstat reports to CEO Mary Barra.